Bridgeen of Cherry and Cinnamon made these fabulous pieces as part of a commission by non other than the musician Gotye (from the hit Someone that I used to know)! It is based on this animated music video for his song Bronte. 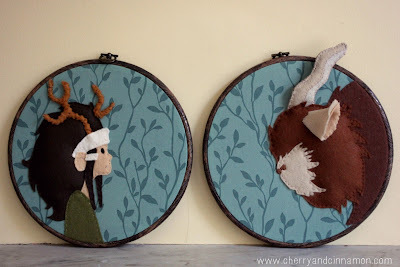 I especially like how the ear and horn on the beast stick out of the hoop and the background fabric works so well here too. Also: how awesome is it to be commissioned by an artist to recreate creatures from his music video? You can see the other pieces Bridgeen created here and read more about this project on her blog. I'm off to check out Bridgeen's blog!